Fill out our simple form and get quotes from local Mobile Ice Rink suppliers. Mobile ice rinks are a fun and popular choice for making ice skating a year round option, whatever the weather is like outside. 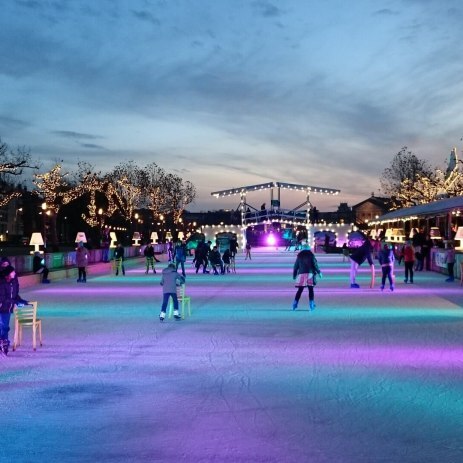 Equally suited for indoor and outdoor events, hiring an ice rink is easier than ever with our wide range of suppliers using the latest technology and designs. Mobile (also known as synthetic) ice rinks come in a range of styles and sizes and are usually formed of small, individual sections which can be put together to create the exact dimensions required at your event. Your ice rink hire supplier will provide skates as part of your hire and you can usually choose between a dry hire or fully staffed option. To find out more about ice rink hire and to hear from the best local suppliers, simply fill in a request form now. We are the leading manufacturer and hirer of synthetic ice rinks. We also have curling lanes too! Having a Mobile ice rink is one of the newest party ideas for the UK. When planning your ice rink hire, be sure to discuss with your supplier and event venue where the rink would be constructed. Mobile ice rinks require a flat surface, preferably tarmac, to ensure correct installation. If you’re planning a winter event then make sure you book up early, as this is always the busiest time of year for ice rink hire suppliers. Lastly, be sure to allow enough time for your ice rink hire to be constructed before guests arrive - the larger the rink, the longer this will take. Your supplier will usually be able to offer you a selection of designs for both the rink and the barriers, so you choose the perfect type of mobile ice rink to suit your event theme. To learn more about ice rink hire and hear from suppliers in your local area, simply complete a request form.